We feel the stock is quite undervalued as the company has its niche area and has been enjoying very good margins in the range of 25-30% (which are rare in manufacturing). The business is sort of a oligopoly wherein the competition is limited and hence a good profitability. The company has a moderate working capital requirement and thus converting most of profits into free cash flows. At CMP of 120, the stock is trading at a PE of just 4, Price to BV of 0.80. The company has good ROCE of 25-30% and has been paying out decent dividends. Dividend yield works out to be 4%+. The growth might be slow over the next 3-6 months due to a demand slowdown in Europe, but as the things pick up the company should do even better as the capacities already exist and the fixed costs get spread over. The company should also benefit from lower taxation going forward (as the new plant at Mundra is a SEZ). Great post. What is your on the debt that OCCL currently holds? I meant to ask what is your take on the debt that OCCL currently holds? Reducing prices will hurt Solutia more than OCCL. If OCCL will loose say Rs 10,000 then, Solutia will loose more than 10 times. Second, I think 70-75% market share is pretty good, it would be tough to grab all the market. Infact even the tyre cos would want to maintain a second source of supply. All the cos usually have 2-3 sources of supply. The lastest quarter hasn’t been good while the co has undertaken a lot of debt. Regarding OCCL, we feel undervaluation is high and markets would recognize the same in due course. Just want to understand on what parameters do you feel that OCCL is highly undervalued. Is it Price/BV, Mar. Cap/Sales or PE? Though Gujarat Reclaim cannot be compared to OCCL, does OCCL have scalability like Gujarat Reclaim? Would like to know your views and parameters to judge the undervaluation in a stock? OCCL has decent scope to expand and grow. They might need to think after 3-5 years. My knowledge on stock valuation is limited and may not make a good reading. 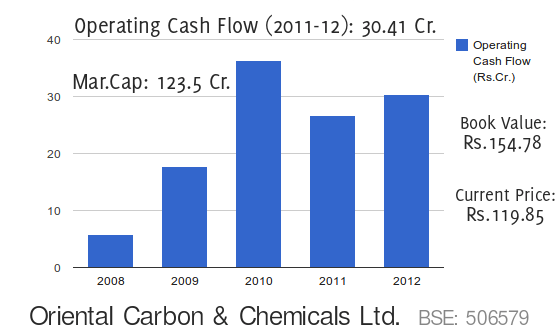 The only time I got it right on stock undervaluation was on Managlore Chemicals where I thought that market cap was unjust in relation to its sales. In case of OCCL specifically I was just trying to broadbase my knowledge since you have mentioned that it is highly undervalued. I do understand that it quoting below its BV and a low PE. Was more interested from a learning perspective than investing. What price level do u expect OCCL to be in 2 yrs considering things unfold as expected? I was analysing OCCL past financials and noticed that their performance improved drastically post 2007/2008. During 1998-2007 a) Their ROE barely crossed 5% only twice b) Net margins were less than 3% with occasional substantial losses during 1998-2004 and during 2004-09 around 4-6%. They have earned high ROE only during the last three years. So my question is what has changed drastically in the last 3-4 years, which has resulted in substantial change in their fortunes. Good to see that you have gone through their performance in detail. Plz refer to the complete mgmt interview, you will get a better understanding. The change has been since about 2005, this is when the co started expanding capacities and getting operational leverage. Also, they were able to tap bigger global customers. The price of insoluble sulphur was increased by Solutia in 2008-09 when the input prices increased multifold. Since then the raw material prices came down but the end product pricing was maintained. So its a combination of scale & better pricing. Continuing my earlier comment: I also noticed that since 1998, only during the 2010 it has traded above book value. Else for most of the last decade it has traded below book value. I have been following this counter for quite some time. Yes, there has been quite a bit of slowdown in EU and hence OCCL hasn’t been able to grow much. I don’t expect too much of weakness in Q2 while stable nos may provide upside. OCCL is one of the cheapest high quality stock available at a v low PE of 7 odd at cmp. OCCL touched 564 congrats Ayush.How are the future prospects ?any triggers? hi Ayush, What is your take on the poor results by OCCL, almost nil topline growth YoY(with decrease in EPS) and topline degrowth QoQ. Can you share your insights and do you think that sales can grow from here? Even though the company business is niche, the growth is too slow. Would like to know your views. Do you find the results disappointing/poor or along your expected line? Also would like to know your views about the numbers posted by Thangamayil. The company is still paying high interest cost but sales growth has picked up and company has finally posted positive operating income(but net loss due to debt). Thanks a lot for you help in answering questions with such patience. Thanks to dalal-street team. OCCL nos are inline with our expectations. Co would be already operating at about 85% capacity utilization so we can’t expect high growth till the Mundra expansion comes up……which should happen over next 1 year.